Try to find at least one other neighbouring pupil who is going to the same school so that your child has a travelling companion. If the Local Education Authority (LEA) provides transport costs, make sure to apply for a bus pass in good time and impress on your child the importance of keeping it in safe place. Make sure your child always has 'emergency money' (separate from any other money, eg lunch money etc) in case she or he forgets their pass, needs alternative transport or has to phone for help. You could also provide them with a phone card. You may worry about choosing the right school; how you can help your child prepare and how to help them get the most out of secondary education. Choosing a school can be really difficult with many open days and visits to prospective schools and a tight deadline for applying. The following top tips may help to make the process a little easier. Make time to talk to your child about what they want out of secondary school. You and your child may have different reasons for picking a school and it is important to discuss these together. Do your research. At the end of year 5 or the start of year 6 your local authority will produce a booklet giving details of secondary schools in your area: their open evenings, their admissions criteria and important dates for you to remember. You can also check the schools' websites. Ask other parents or your child's primary about their experiences of local secondary schools. Visit potential schools with your child in year 5 and then again in year 6 so you have plenty of time to consider your options. Talk to your child about what they want to know before you visit any schools. Make sure you get your child’s application form in on time. Some Local Education Authorities (LEAs) prefer these sent via the internet - ask at your primary school or local library if you need help. Don't pin all your hopes on entry into one chosen school. Try to have at least one second choice that you'll both be happy with to avoid the disappointment of missing out. It is possible to appeal against the decision. If your child doesn't get their chosen place, please see our appeals section. Once your child has a place at a school, make sure you attend the open day arrange for new pupils. These days are vital to help new pupils settle in. Shop for uniform and equipment in good time. If this is expensive, it may be possible to get help with the cost. Contact the school or the LEA to find out. If your child feels nervous, take time to listen and reassure them that all children feel this way before starting secondary. Travel the route to school together a few times so it becomes familiar and use the buses if that is part of the route. Visit your LEA's website for details on assistance such as free school transport or free school meals. If your child is eligible, make sure you apply in good time. You may worry about your child's personal safety at secondary school and it is important to ensure your child knows they can turn to you if they are concerned about anything. Bullying can happen face to face or online (known as cyberbullying), or in any indirect form that makes your child feel uncomfortable. It may happen on or off school premises or on the way to and from school. Tell your child that bulling in any form is always wrong and that they can tell you or another adult if it happens to them. Children may find it hard to talk about bullying, but there are signs to look out for that may suggest there is a problem. We have a website dedicated to bullying with lots of information for parents, children and schools. Please visit Bullying UK to access further advice. check the schools website for details of events and attend as many as you can. make sure the school is aware of any changes at home, such as parental separation. Where relevant, make sure the school also contacts the non-resident parent. Encourage your child to get organised for school the evening before. This can save them (and you!) a lot of undue stress in the morning. Remind them to check their timetable for the following day, pack their bag and lay out their uniform if necessary. Try and resist the temptation to do everything. Your child needs to learn to manage their time efficiently and they won’t do it if you get everything ready for them. At this age, children start to want more privacy when they're getting ready. Consider organising a schedule for the bathroom in the mornings so no-one is made late by waiting. Your child will probably have several homework tasks to complete each night, and most schools record this in a homework diary. Make a note to yourself to read and sign the diary at least once a week to make sure your child is keeping up with their assignments. Have a calendar on display at home clearly marked with different equipment needed for different days (sports kit, music, projects etc.) Encourage the habit of looking at the schedule the night before and organising schoolbags there and then. If your child is getting to school on public transport for the first time, find out if any friends live nearby so they can travel together. Use every opportunity to keep in contact with the school - this may be more difficult now that classes are bigger and your child has many different subject teachers. However, if the school has a website, be sure to check regularly for information updates and news. Once your child has started school, make time to talk and listen to your child each day to check how things are going. Just giving attention in this way can help your child feel supported and more confident. However, resist the temptation to ask too many questions, especially when a child first gets home from school and is likely to be tired, hungry and short-tempered from coping with many new people and things. 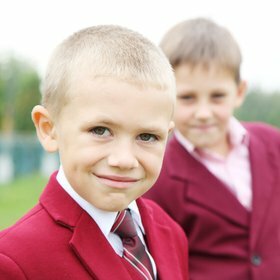 If your child is attending boarding school, make arrangements for him or her to be able to contact you or other members of the family on agreed days and times, providing him or her with a phone card.